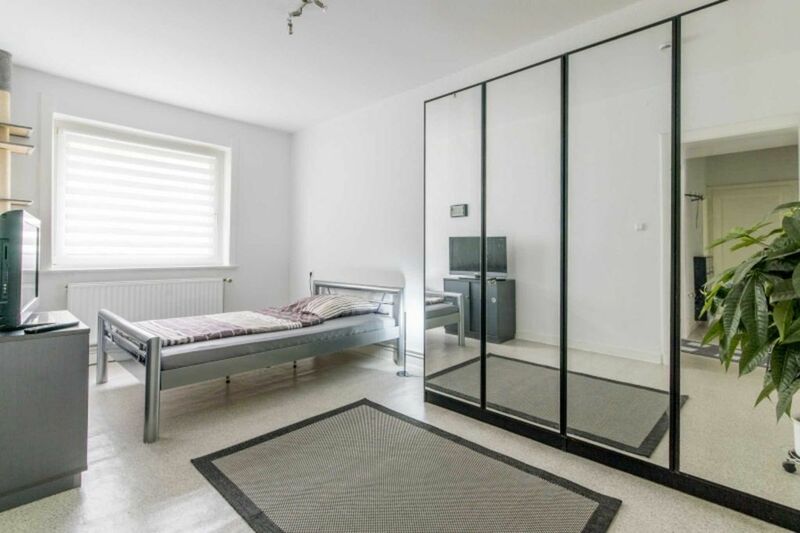 This modern room is located on the first floor of an apartment building. In the bed there is enough space for one person. The kitchen includes a coffee machine, kettle and fridge. The bathroom has a bathtub. Please let us know your arrival time in a timely manner. The keys are handed over on the day of arrival directly in the booked apartment / house by the landlord. Arriving at the airport: Arriving from the airport to the property The S-Bahn S 5 (direction: Paderborn) takes you directly to the main station. The journey takes about 23 minutes. Arriving at the central station, you can then take the subway line 1 (direction: Laatzen / Sarstedt), 2 (direction: Rethen), 8 (direction: Messe / Nord) to the object stop & # 132; Schlägerstr. & # 147 ;. The journey takes about 6 minutes. Arrival at the main station: Directions from the main station to the object From the main station you can take the subway line 1 (direction: Laatzen / Sarstedt), 2 (direction: Rethen), 8 (direction: Messe / Nord) to the object stop & # 132; Schlägerstr. & # 147 ;. The journey takes about 6 minutes. Connection from the object to the fairgrounds: From the subway station & # 132; Schlägerstr. & # 147; Take the line 8 (direction: Messe / Nord) to the fair - main entrance Messe / Nord. The journey takes about 18 minutes. Connection to the city center: From the subway station & # 132; Schlägerstr. & # 147; You can take the lines 1, 2, 8, 18 directly to the city center (metro stop & # 132; Kröpcke & # 147;) By taxi: Check in 3.20 EUR + approx. 2.20 EUR / km (at the prices are non-binding). You can call a taxi directly at: taxi-driver-card-hannover. to order. Shuttle service (up to a maximum of 4 persons) from the airport to the object: On request, we can arrange a shuttle service from the airport to the object and back. Price: up to 3 persons & # 150; 45, - EUR per trip. Payment is in cash directly to the driver.